The Bachelor of Nursing with Honours in Mental Health Care is a five-year degree programme. This five-year nursing programme aims to equip students with the essential knowledge and skills to become competent Registered Nurses (Psychiatric) in Hong Kong. They provide a challenge to people who are interested in working in the health care field and have a vision of providing high-quality nursing care in the psychiatric area. The practicum exposes students to the clinical environment in hospitals and other health care settings. Face-to-face supervised practice and coaching take place to assist them to gain clinical competency. The programme is designed according to the requirements set by the Nursing Council of Hong Kong for training of Registered Nurses (Psychiatric) and has gained professional accreditation. Graduates of the Bachelor of Nursing with Honours in Mental Health Care can register as Registered Nurse (Psychiatric) in the Nursing Council of Hong Kong. Student exchange activities and study tours, both local and overseas, are organized for broadening their horizons in nursing and health care. Opportunities for attending international conference are also available. Through this international exposure, students become aware of the current trends in nursing development and appreciate the differences in practice in different countries. Students may even have a chance to present their study projects to international scholars. There are also self-initiated student activities arranged by the Student Union and student societies. Opportunities are available for the graduates of the programmes to advance to postgraduate studies in Hong Kong and abroad. They can choose to study further in the field of nursing or other health care subject areas, according to their career plans. The programme prepares students to be Registered Nurses (Psychiatric) and practice in Hong Kong. Upon obtaining the academic and professional qualification, graduates can work as Registered Nurses (Psychiatric) in various health care settings, such as hospitals, clinics, rehabilitation centres and residential care homes. As the graduates gain clinical experience, they will gradually progress to becoming senior nurses and take on different roles, such as advanced practitioners implementing advanced nursing practice; managers overseeing a work unit and supervising the junior nurses; or educators engaging in teaching activities within an educational institution. 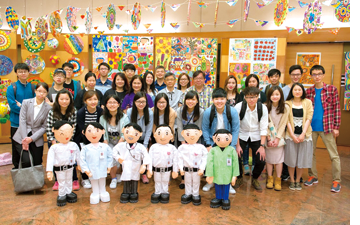 At the closing ceremony of the ‘Health in Mind’programme of Kwai Chung Hospital on 16 April,over 80 Mental Health Nursing students and five academic staff members of the Division of Nursing and Health Studies joined a group of 800, including people recovering from mental health problems, medical workers and volunteers in setting the Guinness World Record for the largest fingerprint painting. 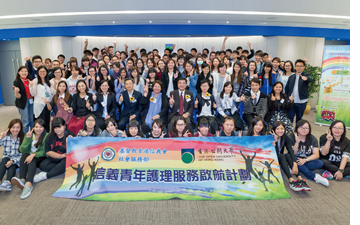 The OUHK and the Evangelical Lutheran Church Social Service – Hong Kong jointly launched the ‘Navigation Scheme for Young Persons in Care Service’, with the aim of inspiring young people to pursue a career in health care. The orientation day was held at the OUHK, and was officated by the Assistant Director (Elderly) of the Social Welfare Department, Ms Pang Kit-ling; Chief Executive of the Evangelical Lutheran Church Social Service – Hong Kong, Ms Susan Chan; the President, Prof. Yuk-Shan Wong; and the Head of the Division of Nursing and Health Studies, Prof. Joseph Lee. Under this two-year scheme, students will work in an elderly care or rehabilitation centre while embarking on the Diploma in Health Studies (Community Health Care) programme at the OUHK. On completion, graduates’ tuition fees will be reimbursed by the Social Welfare Department.